However, unlike previous years where he's been Honda mounted, 26-year old Johnston becomes the latest leading rider to make the switch to BMW machinery for the 1000cc classes and he'll line up on the Bavarian giant's flagship S1000RR machine in the RST Superbike, RL360º Superstock and PokerStars Senior TT Races. Johnston joins the likes of Guy Martin and William Dunlop at BMW - with more expected to follow suit - and, having been the dominant marque at TT2014 in the hands of Michael Dunlop, it confirms that the manufacturer is now one of the favoured mounts for the challenges posed by the Mountain Course. East Coast Construction Racing and Lee Johnston will benefit from the BMW Motorrad UK International Customer Racing Programme, which will provide the team with technical and product support. Having won the 2013 TT Privateer's Trophy, Ulsterman Johnston, who now bases himself in Hull, made further strides forward at the TT in 2014, culminating in a best finish of fifth in the RL360º Superstock Race, also lapping in excess of 127mph. He also took a top ten finish, his third to date, in the opening Monster Energy Supersport Race while his best lap so far around the 37 and ¾-mile course was recorded in last year's opening Superbike Race with an impressive speed of 127.391mph. Johnston will also be amongst the favourites in the two Supersport Races where, like the 1000cc races, he's switched manufacturer this time lining up on a 675cc Triumph Daytona. 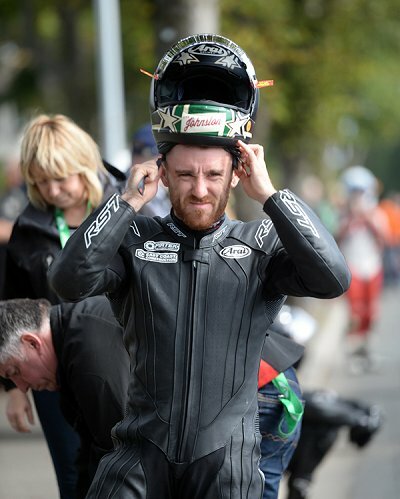 As well as competing in the Isle of Man TT, East Coast Construction Racing and Lee Johnston will also contest the North West 200, Ulster Grand Prix, Macau Grand Prix and selected British Superbike Championship events and will be backed during the 2015 season by Leamington Spa based company Burdens. "I think we showed our potential in 2014 in all the classes at the events we contested and as a team we are looking to build on that for 2015 with the aim of being a regular feature on the podium at the International Road Races." "The TT remains the priority for me and East Coast Construction Racing and we know how hard it is to make the breakthrough into the podium positions around the Mountain Course. But we took some solid results there last year despite carrying an injury from the North West 200, and with the increased support from BMW Motorrad UK, Burdens and all our other team sponsors we will be as ready as anyone come June."